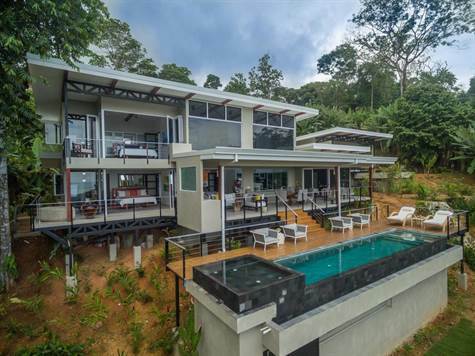 This 4,000 sq ft luxury home is located within the boutique gated community of Villas Sangha. Designer Cynthia Voetsch used her knowledge of Costa Rica to custom build this luxury home in 2018 with contemporary Balinese architectural elements and style. Located on a 1.40-acre lot of lush rainforest jungle and ocean views, this property features four master bedrooms, an indoor and an outdoor living room, and a high-end kitchen with a built-in wine cooler. It also includes all of the features most homeowners are looking for: a lush rainforest setting with an abundance of wildlife, an infinity swimming pool, easy access to a family-friendly beach, and a close proximity to local schools and other Costa Rica attractions. This property is ideal to invest in for a second home, and there is a viable rental opportunity there as well. Three of the four master bedrooms are located in the main house. All three of these master suites feature a large, comfortable king bed with cream bedding, accented with colorful pillows and bedspreads. Each master suite includes built-in cabinets, a ceiling fan, and their own private terrace. Each master features an ensuite bathroom, including grey slate stone sinks and a combination indoor/outdoor shower. It features an enclosed glass shower indoors and an open-air wooden shower on the terrace. One of the suites includes a stone soaking tub on the terrace as well. The fourth master suite is like its separate apartment. It’s beautifully decorated in cream with pops of blue throughout. The suite includes a kitchenette with a microwave, a small indoor table, teak flooring, and an indoor glass shower with two shower heads. The outdoor area features its own plunge swimming pool, a swing sofa, two lounge chairs, and a wooden dining table. This separate suite has its own private entry with unique carved art at the front. The high-end kitchen and both living rooms meld together with a light, airy design complete with splashes of blue, green, and yellow, making you feel like you’re right at the beach. The high-end kitchen features grey painted walls, custom-made cabinetry, and stainless steel appliances, including a Kitchen Aid gas range. It also features stone countertops and a large wine cooler, ideal for entertaining. The glass bi-fold windows open up to the dining terrace, which creates an indoor/outdoor kitchen feel. The terrace dining room and living room features a hand-crafted wooden table and eight chairs, as well as an additional sink and ice maker, and a Kitchen Aid BBQ. It also features a custom-made sofa with cream Sunbrella fabric, accented with yellow throw pillows. The indoor living room includes a double height ceiling, which is covered in grey slate stone and features built-in shelves, which enclose an HD flat-screen television. It features a sectional cream sofa, made with all weather-proof Sunbrella fabric. All of the furniture is local custom made in Costa Rica. This living room also includes bi-fold opening glass doors that open up to the terrace dining and living room area.